March is Women’s History Month, which means it’s the perfect time to pay homage to the great female authors that we have read throughout history. 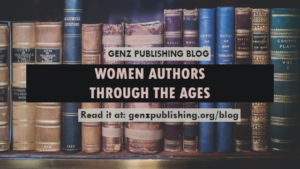 As we take the month to honor women and their voices, it is important to consider the wonderful female writers that have used their works to influence society. Although a traditionally masculine name, George Eliot was the pseudonym for Mary Ann Evans. Evans was born in 1819 in Warwickshire, England to a prominent family. She was well educated and loved reading and writing from a young age. After her mother died, Evans’s father moved them to Coventry, where they lived until he passed away in 1849. From then on, Evans lived in London and began contributing to the Westminster Review as a writer. She would later become the journal’s editor and was revered in literary circles. After Evans was encouraged to write by her lover, George Henry Lewes, she created a pen name to ensure her work would be taken seriously in a time when female authors only wrote romance novels. Evans’s books were philosophical and realistic, and she wanted her concepts to be known. It is clear to see that she had a love of knowledge and writing that inspired her daily. Evans is considered one of the greatest British authors of the 19th century. She completed numerous major works—her most famous being Middlemarch, a study of the different classes in England. This is known as Evan’s, or rather “Eliot’s,” masterpiece. The almost 800-page novel considers all aspects of life in England, showcasing her talent for realism and psychological observations. Born as Virginia Stephen, Woolf was part of a successful Victorian family, and her father was a great literary figure and editor in the 1880s. Woolf began writing as soon as she was able. The Stephen family often traveled from city to country, which allowed Woolf various experiences and insights to life. For a time, she stopped writing after losing her mother at 13-years-old. Woolf suffered from depression, and when her father died in 1904, she had a nervous breakdown. This struggle with mental illness would remain with her for life. However, this did not stop Woolf from becoming one of the greatest authors of the 20th century. Known for her innovative work, Virginia Woolf changed the way people wrote, following the modernist movement. Woolf used her mastery in “stream of consciousness” writing to explore ideas such as gender roles, sexuality, and class. She would dive deep into her characters and expose their internal feelings and thoughts for all to see. War and its residual impacts were given spotlight as she dealt with characters that were coming out of World War I, leaving powerful points for readers to consider. One of her major works, which is still widely read, is To The Lighthouse. Like many modernist novels, this book has a deep philosophical introspection that focuses on childhood memories and adult relationships. Woolf was a strong woman who had no issue revealing every secret thought of the human mind. Born in Ohio in 1931, Toni Morrison was the second child in an African-American, middle-class family. Even though her family faced immense racism, their optimism appeared infallible. Morrison had wonderful parents who taught their children folktales and songs from their heritage. Perhaps due to this exposure, she began reading at an early age, enjoying works such as Austen and Tolstoy. Morrison went on to study at Howard University and earned her master’s at Cornell University. She started working at Random House in New York City and became the first African-American female editor in their fiction department. Her substantial influence allowed diverse literature to move forward. Morrison’s most well-known book is Beloved, a novel that spanned into a trilogy. Inspired by a true story, Morrison captures Margaret Garner’s tale of running away from slave hunters and killing her two-year-old daughter to spare her the fate of becoming a slave. The daughter’s spirit, known as Beloved, goes on to haunt her mother and family. This novel won the Pulitzer Prize in 1988 and was intended to be read together with its trilogy. Because of her incredible storytelling and the strong aspects of American reality, Morrison won the Nobel Prize in Literature in 1993, cementing her place in history as the first African-American woman to win this award. Morrison remains one of the most successful black women authors of all time. Julia Alvarez was born in New York in 1950, but she spent the first ten years of her life in the Dominican Republic. It is said that Alvarez had an immense talent for storytelling and would entertain guests when they visited her family home. In the Dominican Republic, Alvarez’s family was considered wealthy, but they were forced to flee to the United States in 1960 and would struggle in poverty while back in the U.S. This surely influenced her first novel, How The Garcia Girls Lost Their Accents. This was the first novel by a Dominican author to be written in English. It spoke of aspects in life such as class and race, traits that carried over to other novels throughout Alvarez’s career. Her work was praised for its integration of assimilation and ethnicity. She writes about her own experiences, adding a realistic touch to her tales, and does not shy from political and social ideas. Julia Alvarez is considered one of the most successful Latina authors, a title well earned through her beautifully crafted ideas and stories. Amy Tan was born in 1952 to Chinese immigrant parents. Her family had a happy life until both her father and brother died of brain tumors. Believing their deaths were the result of a curse, Tan’s mother, Daisy, packed and moved her two remaining children to Switzerland. During this time in Europe, Tan learned that her mother had previously been married to a Chinese man and as a result, provided her with three half-sisters. This inspired her first novel, The Joy Luck Club. Tan wrote regarding her experiences and the difficult relationship she had with her mother, often seen throughout the theme of mother-daughter focus in her novels. She has gained criticism for her work due to the portrayal of Chinese culture and reinforced stereotypes; however, Tan is merely recounting her personal truth and experience. An author intent on staying true and authentic to who she is, no matter the risk, Tan is a wonderful storyteller whose characters and images stay with readers long after the novel has ended. First published in 2000, Zadie Smith is an author to be reckoned with. She is a contemporary novelist, essayist, and short-story writer. Smith has released seven books, along with short stories and essays, in addition to her career as a professor at New York University. Born in London in 1975 to a Jamaican mother and English father, Smith had many aspirations as a child. Yet, it was her love of literature that won in the end, a passion that led her to study English literature at Cambridge. Her first published novel was White Teeth, which quickly caught the attention of many. It became a best-seller almost overnight. Reviews proclaimed that Smith’s voice within the novel was remarkable and fluent, comparable to other great writers, but ultimately a voice all her own. White Teeth explored race, marriage, and modern life. Smith is considered a postmodernism writer who stays close to realism. Her most recent novel was published in 2018, indicating to the world that Smith is nowhere near slowing down her writing career. All six of these female authors display not only inspirational life stories but extreme talent. They write based on realistic experiences while still maintaining a strong, unique style and voice that is all their own, spinning beautiful tales worthy of remembrance. Society hardly needs to wait for Women’s History Month to talk of these great authors, but it certainly serves as a welcomed excuse.